Here we are in Honduras for the next few days! 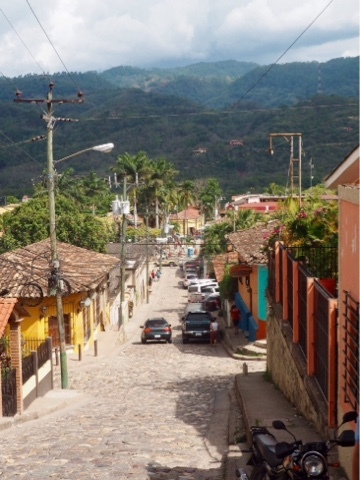 Antigua to Copan is a fairly long drive, so we set off at 4am, to avoid the traffic through Guatemala City and cut down the waiting time at the border. 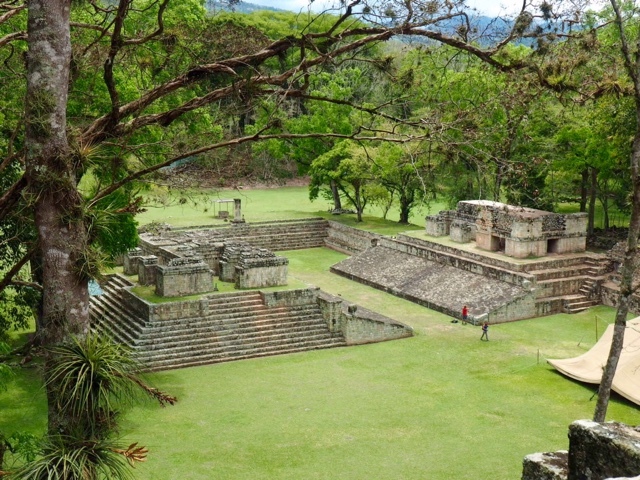 In the end, we got to Copan by lunchtime, albeit feeling a little groggy. Because of this, everyone opted out of activities that afternoon. We walked around the town, which is a pretty place, full of cobbled streets, and stopped to get street food for lunch. You hear a lot of warnings about eating street food, but as long as you can see it's been prepared properly, it's often fine, which this was. The rest of the day was spent relaxing at the hotel, napping and using the wifi. I was exhausted both from the 4am start, after a late night, but also from two weeks of continual travelling. I roused myself for dinner though, and we ate baleadas, a local dish of tortillas filled with combinations of meat, egg, beans, and avocado. A lot of the food in this part of the world is made from the same base ingredients, but there are many variations, and all of them have tasted great so far! We stayed out for a few drinks afterwards, sampling the local beers of a new country. The next morning we headed to the Copan Ruins, the main attraction in town. 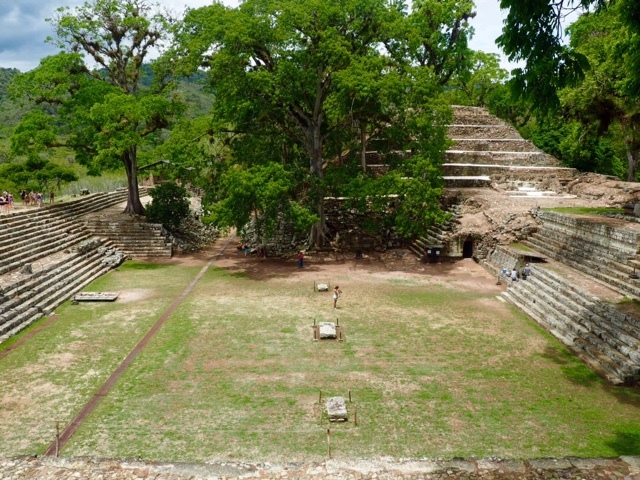 The Mayan site is similar in age and importance to Tikal, but the structures of Copan are much smaller than the temples. There are lots of detailed carvings still intact (though some are now in the museum, with replicas in the site), and our guide was excellent at explaining what they meant, going into particular detail about Mayan numbers, and the importance of the knowledge of the number zero, which made them such an advanced civilisation. Copan is also home to a huge staircase, covered in carvings, and has been immaculately restored, and is now sheltered under a tarpaulin sheet. Our guide was also very well informed about Mayan life in this particular civilisation. 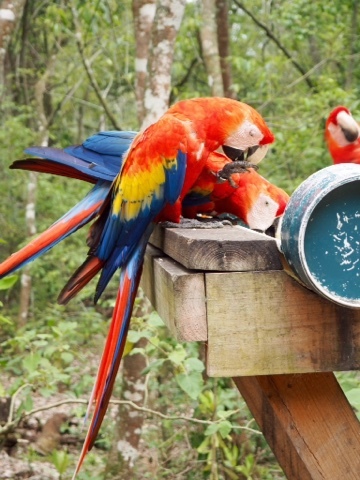 Also, the site is home to lots of scarlet macaws, which have become incredibly used to the visitors, making it possible to get vey close to them! We went back for more baleadas at lunch - you have to try different fillings, right? - then coffee and cake at a cafe near our hotel (Calle Real). Then we piled into the van - and I do mean piled, two of the girls opted to sit on the roof, since everyone does it here! - with a cooler of beers, and headed off to the Luna Jaguar Hot Springs. It poured with rain at first, but that didn't matter once we were in the water (no photos from me yet, have to get copies from the underwater camera!). There's several pools to choose from, but we started off in a big one all together, relaxing in the hot water, sipping our drinks. We used the mud again too, caking ourselves in it and waiting to dry, before washing off in the waterfall. The fall was below the big pool though, so we would make currents to really drench whoever was below. When we eventually climbed out and dried off, we got dinner at the springs too. They barbecued up plenty of meat and veg, and it was delicious! And somehow we still hadn't emptied the cooler, so that had to be rectified! When we got back to Copan we stopped to buy a few more drinks, to have back at the hotel. Swinging in a hammock, on a roof terrace, sipping a beer, is definitely a good way to finish off the day!